The halfway point of the minor league season has come and gone, but not gone is the chance to do a little recouping of the Brewers farm system. If you'll recall back to January I took a shot at positional rankings of Milwaukee's minor leaguers, my rankings - stat based (not WAR) and completely lacking scouting reports. I like doubles and walks, but even more so I like players who are consistent and succeed at higher levels of the minors. And without further ado, where they stand here in July. It's still this guy, how great is this picture? 1. Martin Maldonado - Barely, just barely, am I willing to maintain Maldonado's prospect status but it's retained none the less. Maldonado was the no-brainer call-up after the fluke injury to Jonathan Lucroy back in May and since then he's been about as good as anyone could have hoped for. Maldonado is batting .267 (4th on the team) with five home runs and 16 runs batted in. What's more important, his defense has been as advertised (by which I mean really good). A decision will need to be made when Lucroy returns from his broken hand, but Maldanado has made that a difficult choice for Brewers brass to make. Don't be surprised to see current backup catcher George Kottaras traded around the time Milwaukee makes that choice. 2. Cameron Garfield - The nice thing about prep players is that when a season is lost, early, to injury they are still young enough that development won't (usually) be horribly delayed. Garfield only saw action in 15 games last year but he seems to be bouncing back nicely in 2012... and he's only 21 years old. Since returning to a starting role for the Timber Rattlers at the end of may he's played in 22 games and batted .314 with a .392 on-base percentage. It's doubtful he'll get promoted this year but it's good to see him back on the field. 3. Clint Coulter - With a sigh do I rate Coulter this high. As I've said I don't like to rate a player based on their draft position but that's all I have to go on for this year's first round pick (by the way the new signing rules regarding draft picks is going to do wonders for player development). Coulter was the top pick for Milwaukee in 2012 and is currently with the rookie league Arizona Brewers. Eight games into his first pro season and he's 3-for-31 with a triple, home run and four driven in. In other words, not going anywhere soon, but then he's also only 18 years old. 4. Parker Berberet - It's a wash between the four and five spots, but Berberet gets the slight nod thanks in part to the numbers he put up last season when he hit seven home runs and drove in 40 for Helena. This year he started out with Low-A Wisconsin and was promoted to Brevard County after an injury to our number five guy, Shawn Zarraga. In 36 games between Rattlers and the Manatees Berberet has hit .261 with a .343 on-base percentage. The power has been absent however, as he's only managed six extra-base hits in 119 at-bats. 5. Shawn Zarraga - Before going down with an injury (anyone know what it was?) the 23-year-old Zarraga was off to a nice start for Brevard County. Through his first 28 games he was batting .292 with a .384 on-base percentage. With six doubles, a triple and two home runs he still has more extra-base hits than Berberet. All this adds up to Zarraga likely finding it easy to move ahead of the player that took his spot once he returns from injury. Off the List - Joey Paciorek - Backing up Berberet at Brevard County is Paciorek. He's not doing a bad job, he has a .255 average with eight runs batted in, but he's still the backup. Would I really rate the backup ahead of the starter? Don't answer that. Final Thoughts - We are past the halfway point of the minor league season and there hasn't been a ton of change in this ranking. That could change drastically by the end of the year though, Maldonado should stick in the big leagues and be off this list, Coulter could show why he's a first round pick and Garfield could start flashing more power. Realistically though expect to see this same group of names, maybe with some shuffling of the order, when these rankings are updated next. Baseball is a stat driven game, well past a time when success was measured by home runs and RBIs. It's the era of OPS, where stats require equations that the average fan doesn't begin to understand or attempt to use. And at the helm of the modern day statistical ship is the big one. WAR. A stat that can actually tell you how many wins a player adds to your teams total. It's also one of the most overused and values-less stats that floats around the baseball world. Wins Above Replacement, a stat that is intended to tell you exactly how valuable a player is to a team by measuring how many wins a player adds over a replacement bench or Triple-A player. For example Matt Kemp, last years runner-up to the NL MVP award, had a WAR of 10 (by the baseball reference formula) for the Los Angeles Dodgers. What that means is he was ten wins better than a player that the Dodgers could take off the bench or out of the minor leagues 2011. One thing to remember about WAR is not that it's wins provided above a player that put up the major league average at his position, it's win's provided above a replacement player. That replacement player is someone who is coming in off the bench or someone who is called up from the minor leagues. The stat is put together by combining a number of different statistics, I won't try to sell you on it but this is a better write up than I could come up with. In practice, this stat allows a user to say player X is worth more wins to his team than player Y. A cut and dry measurement of how important a player is to his team. So why doesn't it work? To find out the WAR number of a player you can go to a website like Baseball Reference and find it in their stat line. Or you can go to Baseball Prospectus and find it in his stat line. Or you can go to Fangraphs and find it in his stat line. There's only one problem, all three numbers will be different. Take Jose Bautista for example, according to Baseball Reference his WAR was 8.5 in 2011. On Baseball Prospectus it was 10.3 and on Fangraphs it was 7.1. Which of these stats is right? Is one better than the other? If all three websites use a different formula to come out for the same stat how is any one of them valid? There a simplicity to measuring things like batting average or earned run average because every time you measure it your numbers are going to be the same. The WAR of a player cannot be three different numbers and still be taken seriously. If one site values one aspect of their WAR equation more than another then the stat becomes subjective. Stats can't be subject to a value judgement like that. Measuring defense in baseball is by far one of the most difficult things to do. It's been widely accepted that errors and fielding percentage tells us very little beyond how many majorly botched plays a defender makes in a season. There have been numerous attempts to accurately quantify defense but thus far nothing has taken a lead. WAR uses these less than sound defensive metrics, be it one of the many attempts at a zone defensive ratings or otherwise, in its formula. This is unsound. Until there is a more widely accepted measurement of defense all of the WAR ratings will be based on ratings that are, in and of themselves, unreliable. Baseball will find a valid system of measuring it's players defensive capabilities but until they do, basing a statistic on the current flaw-ridden defensive metrics only serves to poke more holes in a stat that has as many holes in it as swiss cheese. Assumption. That is what the presumed replacement value is. It is an assumption about what the replacement player can do, for good or ill. When a player has a negative WAR, like Casey McGehee did last year, can we say that the replacement player would have been better than he was? Perhaps, but that also draws a conclusion that this replacement player will perform at a certain level. WAR generalizes. One teams replacement option is different then the next team's. If you have a top prospect waiting in the wings, like the Brewers did with Taylor Green, it probably would have been a safe bet to say Green could have done a better job. But if you didn't have a good option? If your replacement level player has a negative WAR? That's the problem of WAR, a replacement player can have a negative wins above replacement value. So then what? Another replacement player with an even lower value? The stat becomes ineffectual. Even more to the point, you just can't measure a real players actual performance against a generalized, assumed performance of the so-called replacement player. The fact of the matter is, WAR isn't going away. As long as performance can be measured by a variety and combination of statistics then new statistics will be derived to measure what a player actually contributes to his team. It's a noble effort, to establish how many wins a single player can add to his team's performance over the marathon that is the professional baseball season, unfortunately it's also one that's inherently flawed. Should the metric world cease it's attempts at a better measuring stick for Major League players? Not at all. But for those that consider themselves statistically enlightened they must also recognize the problems that an all-encompassing stat like WAR can bring. You can use statistics to prove anything and WAR gives credence to that old standby. The truth of the matter is that quoting a player's WAR is about as convincing as quoting his RBIs. To measure a players performance you must use several statistics, not several statistics mashed together in some sort of sabermetric stew. Maybe some day baseball's all-consuming and all-enveloping stat will come to fruition but until that day having more than one way to measure a player is not a bad concept. Yesterday afternoon my twitter feed blew up about how Miss America, Laura Kaeppeler, is going to be tossing out the first pitch at the Brewers home opener, and that, *GASP*, she is a lifelong Cubs fan! Oh, the horrors! How can we sully our unofficial state holiday with such an atrocity. People should be fired, wars should be waged.....we the good people of Wisconsin should take over the the military scrap pile on the Wisconsin/Illinois border and launch an all out assault on all that is Illinois, and as many of you have suggested on twitter, we should boo the living hell out of Miss America! It was just months ago, we thought she was the cutest thing ever for wanting to meet Aaron Rodgers! It was the beauty queen and the football star...classic Americana! A Packer fan, a true Sconnie right???? But wait, (record scratch), how can she be a Cubs fan then? ... Have you ever been to Kenosha? You do realize that with METRA running there, it is the northernmost grip of what some like to call Chicagoland. It's not like this is a girl who was born steps from County Stadium, no, this is a girl born in an area where Chicago and Wisconsin blend together. Seeing a Packer/Cub fan is a very common thing in Kenosha! Wisconsin hasn't had a Miss America since 1973, I'm guessing most of my readers weren't even born then (I wasn't). We know that we're a damn good looking people, but let's face it, there's a national stereotype that we're not....I personally, would like to thank Laura for helping to make Wisconsin look good. Miss America travels the country, working with many charities, often involving children, and spreads positive messages. She will also be representing the United States in the Miss Universe pageant later this year. Sounds to me like ideas we should all be applauding. Don't make a fool of yourself Milwaukee, do the right thing, stand up, clap, cheer as the ball crosses the plate. And if you can't even fathom that idea, stay out in the parking lot for one more beer. Booing Miss America, is something an imbecile would do. Oh, I heard a rumor that Ryan Braun grew up a Dodgers fan...grab your pitchforks and torches Milwaukee! I’ve admittedly been lazy in trying to get my first post up. So in true lazy fashion, my first post will be gimmick style. 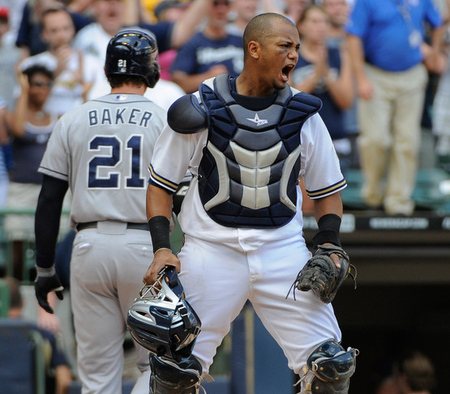 I’m going to give you 43 reasons to be excited about this upcoming Milwaukee Brewers season. One for each of the Brewers seasons in Milwaukee. So without blathering any further, here they are, enjoy. 3. Watching Alex Gonzalez flash a little leather, no disrespect to my man Yuni B though. 4. Getting to see the Central Division Champs pennant that will be at the stadium reminding us of what a special year it was in 2011. 5. Getting a full season of Zack Greinke. I, like most optimistic fans expect big things from Mr. Greinke. 6. Anytime you get to spend a Saturday afternoon at Miller Park. 7. Trying to remember the actual game after spending a Saturday afternoon at Miller Park. 8. Nori Aoki. This is the most excited I’ve ever been for a 5th outfielder, though I really don’t know what to expect and playing time might be hard to come by. 9. Playing 17 games against the Houston Astros. 10. Monitoring Lucroy’s beard throughout the year. 11. Georgie “Greek God” Kottaras and his beard. I love Georgie more and more every time he plays. 12. Axford’s hair and ‘stache watch. Might as well get these three out of the way. 13. Hopefully being able to watch Rickie Weeks tear things up for an entire season. We love you Rick. 14. Carlos Gomez on the base paths. The guy is a terror when he’s there; hope he can do it a little more this year. 15. Another year of Nyjer Morgan. I have loved Nyjer since his days with Pittsburgh and enjoyed him thoroughly last year. 16. Tony Plush, but not too much Tony Plush. Don’t let it jump the shark Nyjer. Just enough to keep us engaged. 17. The death of Beast Mode. It was great when it happened, but like untuckem when Cameron left, it must go with Prince. 18. Gomez making amazing plays in CF. Nyjer crashing into the wall and making plays in CF. 19. A potentially huge year out of Yovani Gallardo. Who can’t see him winning 18-19 games? 20. Trying to come up with more nicknames for Narveson. Narvdog, Narvster, Narvy, Narvs. There’s got to be more right? 21. Seeing if Mat “Not Matt” Gamel can be a late bloomer. 22. Playing 17 games against the Chicago Cubs. 23. The return of Manny Parra’s cry face. 24. Wondering which Corey Hart we will get this year and making fun of him whether he’s good or bad because he is a weird dude. 25. Freaking out every time K-Rod comes in to pitch a close game, ok I’m not looking forward to that. 26. Accidentally falling asleep on the couch during a Sunday game, waking up in the 6th inning and Todd Coffey is pitching. Oops that was on my 2009 list. 27. Hopefully watching Nyjer take out his digger and toss it in the general direction of a Cardinals pitcher again so they can stay on the high horse they are on. 29. Wearing my Alcides Escobar jersey shirt to at least one game. 30. Wolfie smacking a double and getting a 2-1 win with Georgie scoring the run that puts them ahead. 31. A Marco Estrada spot start if Marcum’s arm falls off. 32. Kameron Loe getting in and out of terrible jams. 33. Playing 15 games against the Pittsburgh Pirates. 34. Watching super drunk Brewer fan and super drunk Cub (or Cardinal) fan have a completely pointless argument at Miller Park. 35. Seeing Aramis Ramirez go deep hopefully more than just a few times. 36. Braun gunning some poor soul out at home. 37. Enjoying shots of Counsell during games, but not seeing him in uniform. 38. Listening to Brian Anderson say something to try and make Rock laugh, but he of course won’t laugh. 39. Hoping that Joe Block’s voice is just close enough to Uecker that if you turn a game on in the middle you question yourself just like with everyone else who has ever worked with him. 40. Getting to see some young guys come up late in the year and have some big moments. 41. The potential of winning a division that is still wide open, though the Brewers have been set in stone in 3rd by the media. 42. A monster Braun homer that ties or wins a game, maybe clinching another playoff spot? As an ever optimistic fan, I feel they are definitely talented enough to win the division or return to the playoffs as one of the wild cards. The thing is, we don’t know what will happen and that is the best part. Go Brewers. Rounding out our analysis of the Brewers organization is an in-depth look at the starting pitcher, which for a change might be the strongest group. This is also the group that may spark the most debate among my method of ranking prospects. First, there will be a couple of notable absences from this group - last year's first round draft picks Taylor Jungmann (12th) and Jed Bradley (15th). While they need to be mentioned on this list I won't be ranking them being on draft position or Arizona Fall League stats. Bradley is widely considered one of the the top pitching prospects (if not the top) and is very highly regarded. There is some concern about workload for Jungmann, he pitched a ton last year for Texas. Another name that isn't on the list just yet is last year's second round pick, Jorge Lopez. Lopez did pitch 12 innings for the Arizona rookie Brewers. He struck out 10 with a 2.25 ERA. Where these three pitchers land will be a determination of how highly the organization thinks of them. Early indications would put Bradley and Jungmann as high as Brevard County (High A). If the team is looking to lighten workloads short season Helena would be a better choice. Lopez... probably Wisconsin (Low A) at best. In six months all three of these guys should be on this list, but right now I won't be ranking them based on where they were drafted. Moving on, here is a look back at our other position breakdowns with an update to the relief pitchers section. Apparently my third ranked relief pitcher (Robert Hinton) signed with Baltimore. My writing layoff finally caught up to me. 1. Wily Peralta - After spending most of the 2011 season with Double-A Huntsville (21 starts) Peralta was bumped up to Triple-A Nashville where he made five very impressive starts. In 31 innings at the minors top level he was dominant, with a 2.03 ERA with 40 strikeouts and only 11 walks. For the year he had a 3.17 ERA in a career high 150.2 innings pitched. The big improvement was his walk to strikeout rate which had been so-so the prior season. In 2010 he struck out 1.63 batters to every walk, that improved by one full strikeout (2.66 strikeouts per walk last season). Peralta should be the first name mentioned if the Brewers need a major league starter, be it because of injury or ineffectiveness. He has a mid-90s fastball and a good breaking ball with a much improved change. A full year at Nashville wouldn't hurt, but Peralta is ready and you wouldn't be wrong to pencil him in to the 2013 rotation. 2. Tyler Thornburg - A third round pick in the 2010 draft, Thornburg dominated Midwestern League (Low-A) batters to the tune of a 1.57 ERA in 68.2 innings before a mid-season promotion. After moving up to Brevard County he was still good, but not quite dominant. In 68 innings with the Manatees he had a 3.57 ERA. For the year he struck out 160 batters in 136.2 innings pitched. Everything indicates he should be with Huntsville in 2012 and he's been climbing the ladder quickly. Depending how the transition to Double-A goes, he could reach the major leagues as soon as late 2013. 3. Michael Fiers - Fiers was too good in 2011 to look past anymore. Prior to last season the question was whether or not he would be able to translate his A-ball success to the more advanced levels of the minors. Well, he looked pretty good last season. In 126 innings split between Huntsville and Nashville he had a 1.86 ERA and struck out 132 batters while only walking 32. He's 26 years old and may have a chance to win a spot on the opening day roster with a strong spring. 4. Cody Scarpetta - Another player who will be in the big leagues sooner than later (whether the Brewers like it or not - Scarpetta had to be added to the 40-man roster earlier than normal due to an invalidated rookie contract). At the moment, he looks more like a future reliever but he will be given every opportunity to establish himself as a starting pitcher. With Huntsville in 2011 he had a 3.85 ERA in 117 innings, Scarpetta has had marginal command though. In his last two seasons he walked 128 batters, too many if he's going to be a starter. Nashville in 2012. 5. Nic Bucci - I was torn between Bucci and Kyle Heckathorn for the fifth spot, but am given Bucci the nod for putting up similar numbers and being two years younger than Heckathorn. At the start of the 2012 season Bucci will be 21 years-old and should be pitching for the Huntsville Stars. With Brevard County last season he had a 3.84 ERA and pitched a career high 150 innings. He also cut his walk rate from 68 in 2010 to 51 in 2011 despite pitching 30 more innings. Final Thoughts - There are a lot of pitchers to be excited about in the Brewers farm system. After struggling to develop any major league pitchers besides Yovani Gallardo the organization has come up with a sizable number of high potential pitching prospects. Along with the eight players mentioned you can throw names like Kyle Heckathorn, Austin Ross, Jimmy Nelson and Brooks Hall in the mix and the group gets deeper. And if former top prospects like Mark Rogers (injuries) or Amaury Rivas (struggled at Triple-A) have bounce back years then you have an even stronger prospect group. This is the deepest the Brewers have been in the pitching department, despite giving up a prospect like Jake Odorizzi a year ago. The future is bright for developing starters in the near future, which is important considering only two of the Brewers five starting pitchers are under contract after this season. There's something about ranking relief pitchers that just feels like a waste of time. It's not that these players won't contribute, it's more that there are so few players that are true relief pitchers. Most relief pitchers are failed starters and when a pitcher is in the minors he is still in the process of being an unsuccessful starter before becoming a successful reliever. 1. Santo Manzanillo - The first concern with Manzanillo is that he get healthy, after being in a car accident in the offseason. Depending on when Manzanillo can start pitching again the hope will be that he can pick up where he left off in 2011. 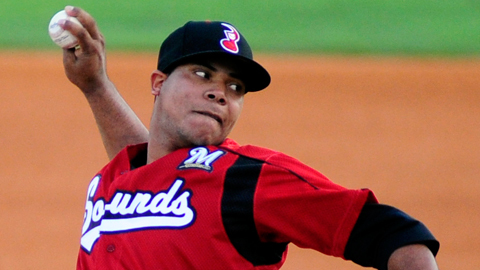 Sporting a high velocity fastball (upper 90s), Manzanillo 62 batters in 61.2 innings pitched. He had a WHIP of 1.14. His numbers were dominant with Brevard County, to the tune of a 1.52 ERA. Getting back and healthy is most important. 2. Daniel Meadows - I am rooting for Meadows, if only because he was drafted in the 49th round of the draft. Splitting time between Double-A and Triple-A, Meadows pitched 77.1 innings and had a 2.68 ERA and 1.09 WHIP. He struck out 74 batters and only walked 23. It's likely he starts the year with Nashville but he will be high on the list when injuries or ineffectiveness open up spots on the major league roster. 3. Robert Hinton - This is where ranking relievers really gets difficult. Getting the nod at the third spot is Hinton, based on a strong 2011 year at double-A. In 54 innings with Huntsville he struck out 58 batters and walked only 19 with a sparkling 1.67 ERA. Hinton has yet to see that success translate to Triple-A however, in 29.1 career innings at the minor's highest level he has an ERA close to six (5.83). UPDATE: I knew I was going to get burned by one of these rankings and Hinton it is. Hinton was a minor league free agent this offseason and elected to sign with Baltimore. Not overly surprising that the organization would pass on a 27-year-old reliever that had been unable to make the transition from Double-A to Triple-A (so far). In his place I offer up Casey Medlen, a 37th round draft pick a year ago. Medlen saw time with rookie Helena and Wisconsin, striking out 44 in 34.2 innings and sporting a 1.07 WHIP. His impressive 11.7 strikeouts per nine innings pitched ratio catches the eye, as does the fact that he walked only 11 batters in his first professional season. 4. Rob Wooten - After missing 2010 with an arm injury, Wooten bounced back with a solid year split between High-A Brevard County and Double-A Huntsville. For the season he had a 1.16 WHIP and 3.09 ERA. Wooten doesn't throw overly hard but he has been a closer for most of his minor league career. He'll be 26 at the start of 2012 and should begin the season at Nashville. 5. Eric Marzec - On the strength of his strikeout numbers and a sharp ERA I'm going with Marzec at the number five spot. Marzec has pitched 103 innings and struck out 111 batters. His WHIP that same amount of time is 1.12. I suppose that's not such a bad number either. The Brewers saw fit to give him a brief look with Triple-A Nashville last season and there's no reason to think he'll start any lower than Double-A in 2012. Final Thoughts - The main purpose of making a relief pitchers list was to have a group for Manzanillo. After him, there are a whole bunch of guys that could be considered relief prospects. Names like Casey Medlen, Maverick Lasker, Jonathan Pokorny or Donovan Hand all come to hand. Basically, there is no John Axford coming up in the wings but there are a bunch of guys with a chance at helping the major league roster. We'll be doing the outfield group a little bit differently. Too many minor league outfielders see time at all three outfield spots to group them into being a right fielder, left fielder or center fielder. That said, some players have established themselves in an outfield spot so when those do pop up we'll let you know. 1. Logan Schafer - Centerfielder of the future, probably very near future. After an injury plagued 2010 season Schafer reclaimed the top spot in the outfield rankings with a strong 2011 campaign. Schafer hit .315 with a .385 OBP and 33 extra-base hits. His best success came after a call-up to Nashville, where he hit .331. A full season at Nashville wouldn't be a bad idea, especially with what could be a packed outfield at the major league level. 2. Caleb Gindl - A corner outfielder most likely, but Gindl has seen a fair amount of time in center. If he is the future replacement for Corey Hart in right it will be quite the change. Gindl is 23 years old and only 5'9" but he can hit. Last season he hit .307 with 15 home runs and 60 runs driven in. He also walked 63 times. Gindl won't be on the big club in 2012 but he's knocking on the door pretty loudly now. 3. Khristopher Davis - 2012 is a big year for Davis, after hitting the ball well at Low-A and High-A he struggled mightily in a stint with Double-A Huntsville. With Wisconsin in 2010 he hit .280 with 22 home runs and in 90 games with Brevard County he hit .309 with 15 homers. After being promoted to Huntsville he hit the wall, batting .210 with only two home runs in 35 games. If he can replicate his success from A-ball with Huntsville next year he will be a top prospect, replicating that success will be no small feat though. 4. Brock Kjeldgaard - This may be a little high for Kjeldgaard, but it's hard to overlook his power. In his last three seasons his home run numbers have been 20, 17 and 24. Arguably his best season was 2011, when he hit .270 with a .354 OBP and 76 runs driven in. He even stole 15 bases. His game is not without holes, but he is a very raw talent and if he continues to improve he could be a legit major leaguer. 5. D'Vontrey Richardson - Speaking of raw talents, Richardson fits very well into that category. A true five-tool prospect, Richardson has flashed every tool possible in his two seasons but is far from any degree of consistency. In his two seasons in pro-ball he has played almost exclusively in center. Last year with Brevard County he hit .284 with 23 extra-base hits and a .327 OBP. It would seem prudent to give Richardson another season in A-ball to sharpen up a few areas of his game. 6. Kentrail Davis - Another example of why I won't rate players based solely on their draft position, Davis saw his stock dip in 2011. Considered a five tool prospect, Davis has shown those tools despite not being able to consistently put it all together. Last season he had 34 extra-base hits and stole 33 bases, but he also hit just .245. It wouldn't be a surprise to see him bumped to Double-A if the organization thinks stiffer competition will draw better results from him. 7. T.J. Mittelstaedt - A 44th round pick in 2010, Mittlestaedt did a little bit of everything for the Wisconsin Timber Rattlers last season. In the minors he's played left and right field, second and third base and he even pitched a couple innings last season. At the dish he hit .293 with an impressive .410 OBP and 29 extra-base hits. Oh and he stole 28 bases. Mittlestaedt will be with Brevard County in 2012, if not higher. 8. Ruben Ozuna - Ozuna will be 20 when the season starts, he saw time with three teams in his second season in the Brewers organization. He played 11 games with the Brewers Dominican Summer League affiliate, seven with the rookie Arizona Brewers and 12 with rookie Helena. Ozuna batted .299 with a .356 OBP and eight extra-base hits. Nothing outrageously good but it catches your eye. Expect a little more stability in 2012, in the form of a promotion to Wisconsin or at least a full season with Helena. You get the feeling the organization wants to see him play. 9. Max Walla - A true project pick, Walla was drafted in the second round in 2009. He spent his first two professional seasons with rookie level Arizona. In his first season he hit .201 with a .282 OBP, in season two he hit .252 with a .335 OBP and in his third season (now with rookie Helena) he batted .285 with a .374 OBP. With Helena he also had 22 extra-base hits and a career high .785 OPS. Nothing too good, but steady improvement. It will be interesting to see what Walla can do in 2012, probably with the Timber Rattlers. 10. Lee Haydel - I really don't know what to make of Haydel. Supposedly he can fly but he was only successful on 17 of 35 stolen bases attempts last year. He's a career .282 hitter in five seasons but with only a .324 OBP, so he doesn't project as a leadoff hitter. If he can improve his plate presence and not get caught stealing bases so often he will probably have a chance to reach the majors as a fourth or fifth outfielder someday. He may have a chance at Nashville's bench in 2012, otherwise it's a third straight season in Double-A. Final Thoughts - This is the strongest position group for the Brewers organization, with some very high ceiling players. With a big season a guy like Kentrail Davis or D'Vontrey Richardson could shoot to number three on this list. Both players are very athletic and have had a degree of success so far, but need to develop more consistency before having a shot at the majors. Schafer and Gindl are about as close to sure things as there are for hitting prospects. They've had success at every level they've been and seem to be ready for a chance at the majors. You also have a guy like Brock Kjeldgaard, who has huge power but strikes out a ton and Khristopher Davis, a college hitter who has hit the ball well at every level but faces his biggest test with a full season at Double-A. Further down the list you have project guys like Ozuna and Walla, who once they start to really take strides in their development could see their stock shoot up. This is a good group of players and the Brewers have to be happy with their options for the outfield. Time for some light Monday morning reading in the form of yet another Farm Report, finishing out the infield. This is a, well, interesting group and I'm not entirely sure what to make of it. What I can tell you is that you shouldn't expect to see any of these players in the majors anytime soon. 1. Yadiel Rivera - You'll hear a player described as "toolsy" and that fits the bill for Rivera. Potential is the word for him. Only 19 years old, Rivera split time between Low-A Wisconsin and rookie Helena with his most success coming in rookie ball. For the season he had nine home runs and 43 RBIs with a .236 batting average. He's got some work to do, but more on that later. The organization will probably give him another chance at Low-A Wisconsin but it wouldn't be a surprise to see him at Helena for another year of seasoning. 2. Josh Prince - A third round pick in the 2009 draft, Prince is a slap hitter who has hit for decent average but a low OBP. Last season with a Brevard County he played in 75 games and hit .281 with a career high five home runs. In three professional seasons he has a .254 career batting average but he's stolen 106 bases in his career. He would seem destined for Double-A in 2012. 3. Mike Brownstein - Brownstein has struggled to stay on the field and so far has been more of a utility player than anything else. That said, the positions he saw the most amount of playing time at were second base and shortstop, so for our purposes we are putting him at shortstop. In the 85 games Brownstein played between Wisconsin and Brevard County he hit .261 with a .350 OBP. So there's that. 4. Hainley Statia - I don't know if we can even call Statia a prospect since he's only spent one year in the Brewers system after spending his first six minor league seasons with the Los Angeles Angels organization. But, he's still only 25 and has yet to make an appearance in the big leagues. He also had a solid first season with Double-A Huntsville. Statia played in 95 games and hit .279 with a .355 OBP and 22 extra-base hits. It would seem he would get a look at Triple-A Nashville next season. 5. 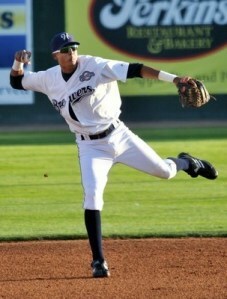 Brandon Macias - Another utility player, Macias was undrafted and signed by the Brewers. He played in 52 games at two different levels, Arizona Rookie League and Low-A Wisconsin. He saw time at second base, third base, shortstop and even played a game in left field. Macias hit .249 with a .335 OBP and 17 extra-base hits. Final Thoughts - Let's take a look at this group, two utility players, one seven year minor league veteran and two actual shortstops. Rivera is the only high potential player in this group, showing a decent pop for a shortstop. But Rivera is very unrefined, he struck out 125 times in 106 games and committed 34 errors. So while he may have high potential he is a long way from reaching it. Prince is an interesting prospect, although at his best he would seem to be a place holder for someone with a bigger stick. That said, if he can consistently hit .270-.280 with 30-40 stolen bases he would be an acceptable starter at shortstop. Double-A will be a big test for him in 2012. As for the rest of this group, it's tough to say much. Brownstein and Macias haven't played enough to get a good read on and they aren't true shortstops. As for Statia... he would appear the most solid all around prospect in the system. That said he's been in the minors for seven seasons, that's a long time. Overall this group is better than it was a year or two ago but it's still not good. There isn't anyone in this group that seems like they will be helping the major league club anytime soon. We'll be back tomorrow with the outfield. will he be on opening day? To cap off our first week back from hiatus (that's right, I'm taking Friday off) we'll take a look at the hot corner. Third base, a position with some legit depth but not necessarily a future starter. Or with three future starters, depending how you look at it. 1. Taylor Green - Much like Gamel, it may be a little unfair to call Green a prospect still. But he's never had any consistent playing time in the majors. Green might have been the only hitter who was better than Mat Gamel in 2011, he hit .336 with 22 home runs and 36 doubles. He drove in 88 and had OBP over .400 (.413 to be exact). His white hot summer earned him a call-up to the majors and his .270 average in 37 at-bats earned him a spot on the postseason roster. His role in 2012 is very unclear, he'll have a chance at making the big league roster but playing time may be hard to come by. Green can spell Aramis Ramirez at third and Rickie Weeks at second, but that doesn't guarantee very much playing time. Because of this, it would not be a surprise to see him back with Nashville in 2012, at least when the season starts. 2. Mike Walker - Taking second place by a nose on the third base prospect list is Walker. He split time between first and third for the Wisconsin Timber Rattlers in 2011 and showed decent power in his first season outside of rookie ball. 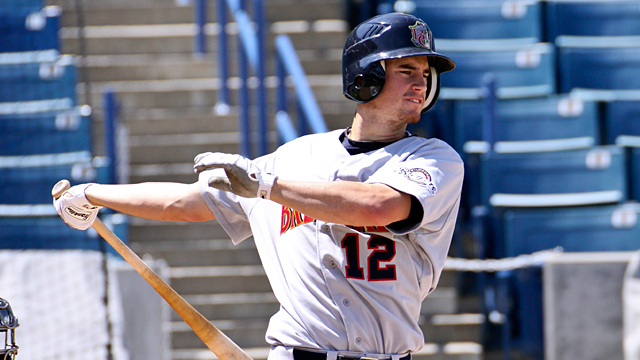 For the T-Rats last year Walker hit 15 home runs and drove in 72 while hitting .277 with a .387 OBP. He'll be with Brevard County in 2012 but his real test won't be until he hits Huntsville. 3. Zelous Wheeler - 2011 was a lost year for Zelous Wheeler. A 19th round pick in 2007 Wheeler had been steadily climbing the Brewers farm system before injuries slowed him down last season. In his five minor league seasons he is hitting .271 with a .371 OBP. Wheeler is best defensively at third base, in very limited time at other positions he has struggled mightily. The next step in his development will be for Triple-A Nashville, but depending on where Taylor Green lands the playing time may not be there. 4. Shea Vucinich - Drafted in the 20th round of the 2010 draft, Vucinich played in 125 games for Brevard County last season. His numbers were solid, especially considering he bypassed Low-A. Vucinich batted .260 with a .348 OBP and drove in 51 runs. 5. Kyle Dhanani - Sure, why not. Dhanani final had a breakthrough offensively in his third professional season. He hit .266 with two home runs and 28 RBIs in 59 games with Rookie level Helena. Tough to read what his future is, but it was likely enough to keep him around for another year. Final Thoughts - Good group, a lot of guys who could have a role on a major league club. Green looks like a potential starter and if his minor league stats are any indication he could be a future star. But the team is not quite convinced, having signed Aramis Ramirez to a three-year deal. That being said, Ramirez could be viewed as a first or third baseman, which means you have three players for two spots (Gamel, Green and Ramirez) and only one of those players has a history of big league success. Have to like the front office hedging their bets there. As for Walker and Wheeler, time will tell. Wheeler right now looks like he could contribute offensively, at least off the bench, but his defense and lack of experience at a position besides third base would cause doubts that he could serve as a utility player. And for a player with only 43 home runs in five seasons starting at third base is almost completely out of the question. Walker could be a legit prospect, but he's more defensively polished at first base than third. Also as a college hitter success at lower levels of the minor leagues should be expected. His first big test may not be until he reaches Double-A Huntsville, which likely won't be until 2013. Stay tuned, we'll be back next week Monday to finish up the infield. Day three of our position-by-position look at the Milwaukee Brewers farm system brings us to the middle infield, second base to be specific. And for a change this group features one of the organizations top prospects. 1. Scooter Gennett - Ryan Gennett, or 'Scooter' if you will, was drafted by the Brewers in the 16th round in 2009. He fell in the draft due to signing concerns but Milwaukee felt they would be able to strike a deal. He didn't play in 2009 (it took a while to sign) and made his debut the following season. Last season Gennett hit .300 with nine home runs and drove in 51 runs while scoring 74 times for High-A Brevard County. He'll start next season with Double-A Huntsville. 2. Eric Farris - Farris had a nice bounce back year with Nashville a season ago. After struggling through a knee injury in 2010, he came back for the Sounds and hit .271 with 37 extra-base hits. Farris never played at Double-A and it would seem he's headed for another year with Nashville. 3. Nick Shaw - An interesting prospect, Nick Shaw has tremendous eye at the plate, maybe the best in the Brewers farm system. Last season Shaw had a .260 average for Wisconsin last year but to go along with that mediocre average his OBP was .374. He walked 82 times for the Timber Rattlers last season. Shaw has split time between second and shortstop, so he projects out as more of a utility payer for the time being. 4. Sergio Miranda - In five seasons in the minor leagues, Miranda is a .286 hitter with a .347 OBP. His career year came in 2010 when he drove in 71 runs with 18 doubles. Last year with Huntsville he took a step back, hitting .270 and driving in only 29 RBIs. He'll likely be the odd man out in the shuffle and promotions for 2012. With Farris at Nashville and Gennett at Huntsville, Miranda seems destined for a bench role next season. 5. Adrian Williams - Choices are few and very far between after the top four in this group, we'll give it to Williams. He was drafted in the 45th round a year ago and played in 56 games for Rookie Helena, batting .238. Williams is only 21 so who knows what will happen next for him. Final Thoughts - Second base can be labeled a strength, mostly on the wheels of Scooter Gennett. He has some power (18 home runs in his first two seasons) and he projects as probably a lead-off or number two hitter, unless his power improves. The concern with Gennett is his defense, in two seasons he has committed 43 errors at second base. Still, he's a station to station guy so if his defense improves he could be a replacement for Rickie Weeks in a few seasons. Farris is a solid prospect, although it's not clear whether Milwaukee views him as a future starter or a bench player. He's got good speed, 70 stolen bases in 2009 and is a career .289 hitter through five minor league seasons. His near future is likely as a bench player and it wouldn't be surprising if he had a chance to win a spot on a big club out of spring training. All-in-all this is a group that features 2-3 players who could contribute at the major league level and one of which has the tools to be a future all-star. 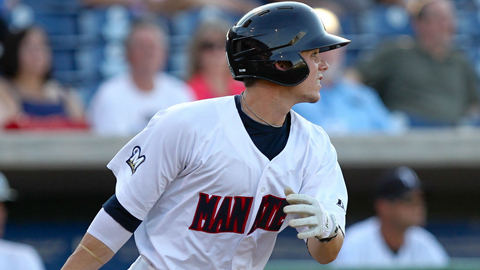 For round two of our look at the Brewers farm system, we continue our trip around the infield with an in-depth look at Milwaukee's first base prospects. First base is one of the better positional groups though maybe without than the high-end prospects the team has had in the past (Prince Fielder). 1. Mat Gamel - It may not be fair to call Gamel a prospect anymore, but for the purposes of this ranking he is. Gamel should start the 2012 season as the starting first baseman and his stats at Triple-A would say he has little left to accomplish in the Minors. 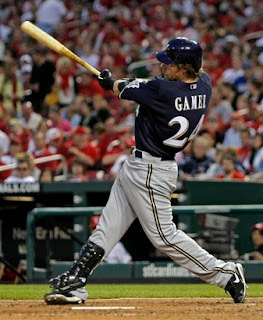 Gamel hit .310 with a career high 28 home runs and 96 RBIs last year. 2. Hunter Morris - Drafted in the 2nd round in 2010, Morris played the majority of his season with Brevard County, batting .274 with 20 home runs and 69 RBIs for the season. He did have a brief stay with Double-A Huntsville, in four games with the Stars he batted .353 with a home run and two RBIs. 3. Sean Halton - Halton is a player who has consistently hit for average throughout the minor leagues, that was a trend that continued for him in 2011. For the year he hit .298 with only seven home runs but with an impressive 39 doubles (that was fourth in the Southern League). 4. Cody Hawn - Another high-round corner infielder drafted in 2010 for Milwaukee, Hawn entered pro ball after being drafted in the 6th round. It was actually the second time Milwaukee drafted him, they first drafted him in 2007 in the 23rd round but he elected college ball instead. Hawn saw his power dip in his second year as a pro, he hit only six home runs, but he did hit .294 for Low-A Wisconsin in 2011. 5. Nick Ramirez - One more corner infielder drafted high by the Brewers, this time in the fourth round of the 2011 draft, almost like they were planning for a first base opening or something. In his first 59 games as a professional he hit 11 home runs and drove in 53 with a .271 batting average. Final Thoughts - This is one of the better position groups in the organization, though Gamel seems to have the best upside of any of these players. That said, he hasn't been able to make the transition to the majors in the short stints he's been in the big leagues. He'll get the chance next year as an every day player but it's good to know the organization has planned for other options. Morris and Hawn would combine to make a really top tier prospect but each has holes in their game. Morris has good power - as evidenced by his home run totals - but his walk count is awful. A .274 batting average is good but a .301 OBP from a first baseman is just unacceptable. Hawn is the opposite, his power dipped last year but his OBP was very nice. To go with his .294 average, Hawn had a .382 OBP. He walked 51 times in 101 games, not too shabby. Sean Halton is another interesting prospect, but his game is not without holes. He will likely be at Triple-A next year and it should be a defining year in his development. The good? Through three seasons in the minors Halton has a .301 average and .352 OBP. The Bad? Through those three seasons he only has 23 home runs. So the question is can he succeed as a doubles hitter and hit for a high enough average to be a productive major leaguer. As for Ramirez, he's a ways from contributing to at the major league level. He put up big power numbers in his first year but his average took a huge dip when he was promoted from Rookie Helena to Low-A Wisconsin, for the Timber Rattlers he batted only .197 in 36 games for the T-Rats. Options, that's what this group offers the Milwaukee Brewers. If Gamel pans out then you have trade bait or possibly a player you could move to a corner outfield spot as a replacement for Corey Hart (although outfield prospects are aplenty in the Brewers system). If Gamel doesn't work out this is a group of guys that, with seasoning, could be major league contributors. With the open of spring training and a new season getting closer by the day, it's time to take an in-depth look at the Milwaukee Brewers farm system. So here we stand, taking a position by position look at the organization's depth going into the new season. A couple notes, I don't like to rate players based on draft position, so I won't. After seeing Eric Arnett drafted in the first round, get rated high by numerous people (myself included) and thus far be an abject failure as a professional it seem senseless to say a player will be a success until he's played in the minors. What this means is that you will see no mention of top picks Jed Bradley or Taylor Jungmann in the pitcher rankings. Another word about my rankings, I value success at Triple-A more than success in rookie ball - regardless of draft position. The level of competition is higher and good numbers against better competition warrant more notice. 1. Martin Maldonado - Signed as a minor league free agent in 2007, Maldonado is an excellent defender with a strong arm. 2011 was his best year as a pro, splitting time between Double-A Huntsville and Triple-A Nashville, he hit .287 with a .373 OBP and 11 home runs. 2. 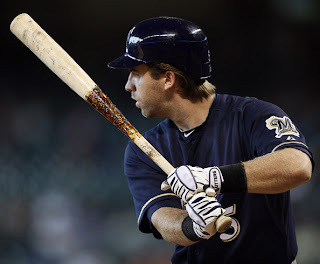 Shawn Zarraga - Zarraga was a 44th round pick for the Brewers in 2007 and has quietly hit the ball well for two consecutive seasons. For Brevard County in 2010 he batted .281 with a .380 OBP and followed that up with a .272 average and .325 OBP in a second consecutive season with the Manatees. It would seem Zarraga is due for a promotion to Double-A Huntsville for 2012, but the organization tends to bounce catchers around quite a bit. 3. Parker Berberet - Drafted in the 25th round of last year's amateur draft, Berberet was not exclusive to the catcher position in his first season, he also saw time at first base. But until his position is more defined we will slot him into the catcher category. In his first season he hit .240 with a .325 OBP and 24 extra base hits. As a college hitter there should be an expectation of early success however and the next season-plus will be very telling. 4. Cameron Garfield - The organization has to be hoping that Garfield will be one to watch, though 2011 was one to forget. The former second round pick played in only 15 games due to injury a season ago. depending on his health, he will likely start his season with Low-A Wisconsin. 5. Joey Paciorek - Not a ton to say about Paciorek, besides that after struggling as a corner infielder for the the his first three seasons he was moved behind the plate in 2011 and finally had success in A-Ball. He hit .257 with 15 extra-base hits in 47 games. His likely destination in 2012 is back with Wisconsin for another season. Although depending on the organization's view of his defense he could be up to Brevard County. Final Thoughts - It would be incorrect to call this a position of strength but it would also be a mistake to call it a weak spot. Maldonado seems to be the only player with big upside, though his consistency leaves a lot to be desired. Maldonado had never hit better than .254 in a season prior to his breakout performance a season ago. If he hit with consistency his defense could - potentially - make him a starter at the big league level but he should have a good chance at winning the backup job for Milwaukee in 2012. You could shuffle the order of the next four names and you wouldn't get any objection from me. All four players have shown some upside but none have done enough to warrant consideration as top prospects. Garfield has, at times, seemed like he could have a major league future and he'll be only 20 when the season starts. If he can come out with a big season his stock would rise very quickly. Overall this group features a bunch of solid players, but none that have distinguished themselves as a potential future starter.